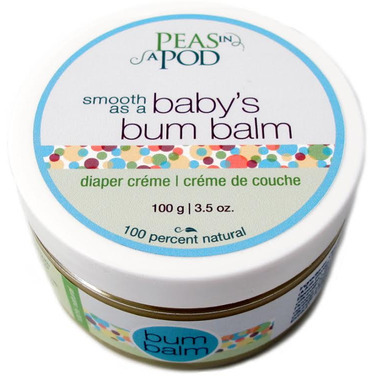 Peas In A Pod is a wonderfully soothing balm from All Things Jill for diaper ouches, dry skin & to help baby's bum feel wonderful! A natural alternative to commercial (and petroleum laced) baby creams/balms on the market. Tested and loved by cloth diapering parents, this soothing balm is also fantastic for cradle cap, and dry skin on mum and dad too! Ingredients: Olea europaea (Olive) Fruit Oil, Prunus amygdalus dulcis (Sweet Almond) Oil, Prunus armeniaca (Apricot) Kernel Oil, Beeswax*, Jojoba oil*, Calendula officinalis (Calendula) Flowers*, Matricaria recutita (Chamomile) Flowers*, Lavandula angustifolia (Lavender) Buds*, Rosa centifolia (Rose) Flowers*, Tocopherol (Vitamin E), Lavandula officinalis (Lavender) Oil*, Rosmarinus officinalis (Rosemary) Leaf Extract*. I swear by this bum balm! After two babies, who never got a bad bum rash, I put into every shower gift and still use it! Love love love! A little pricey, but a jar does last 6 months! This is the only cream we use in our house! It may seem expensive but worth every penny. An amazing product with a heavenly smell of lavender. A friend bought me the whole Peas in a Pod range when I was pregnant and this was definitely my favourite. Now I buy it for all my pregnant friends! Absolutely love this product, it smells like a balsam pitch. This bum balm is an absolute must have! My baby has reflux and was getting bum sores from acidic poops. Traditional petroleum creams were not healing them at all. This balm healed them and he hasn't had one since we started using it. Love this product!! I have been using this balm since 2012 on all three of my children. It is great for anything, protecting the bum, dry skin, etc. It also seems to have a relaxing effect on my third baby when I put some on his forehead. Two thumbs up! Great Product, I have been using this product since my baby born and very happy with my choice. Pricey but works like magic. We only use this on our daughter skin. I have been using this balm since birth. I fully recommend this product all natural. My baby is 6 months now and have not once had a diaper rash. A little pricey but a little goes along way. Love this product. We love this cream! Smells like heaven. We use it more as a preventative bum cream and slather it on at nighttime. Doesn't work to prevent diaper rash and certainly doesn't treat it. This balm was recommended to us by our family doctor and it works wonders. It's super smooth and keeps my LO super comfy and away from rashes and irritation. I've ordered two already and will continue purchasing this product. I love the smell and that it is not pasty. I use this at every diaper change to prevent diaper rash. We tried treating our infant's diaper rash with Vaseline and Penaten, but both didn't help at all. This balm cleared it up right away, and we've been using it ever since. Months later her diaper rash hasn't returned. I also appreciate the lavender scent. It's quite pleasant. I have used this product for both of my kids, they have never gotten a diaper rash when using this cream. If they ever got a rash when I didn't use this product, this would clear it up over night. I would highly recommend it, its worth the price, I've tried several products and this one is the best for little bums! Our favorite diaper balm. Works great for our daughter's sensitive skin and far less messy than traditional diaper creams. My baby is one of those every diaper change poopers so you can imagine the redness and rashes that can pop up quickly. I simply use this amazing natural cream as a preventive measure. If I don't use it every time, it only take one or two applications to make the beginnings of a rash disappear. Love this perfect product! I really want to love this balm, but it simply didn't work for us. I love that it's Canadian made with no harmful products, but we tried two batches and it didn't help prevent redness or diaper rashes. We've since found other natural products that work much better. This product was Introduced to me 4 years ago and works amazingly. This natural product helps to minimize or prevent diaper rash. No need to use a lot, just sparingly apply a thin layer, and it does the trick. It smells nice too and is not thick like Vaseline. My kids diaper rashes disappeared within a day or two. We love this product so much that we continue to purchase It today! Love this cream! Easy to apply and more natural than some alternatives. Very good at preventing rash. I use with the diaper spray too! We love this bum cream! Our babe has only had one diaper rash and this cleared it up over night. It's easy to clean up and safe for using with cloth diapers. It's pricey but goes a long way! It's expensive but a little goes a long way. I appreciate that it's natural and it's gentle on my newborn's bottom. I would definitely repurchase and recommend. This is by far the best balm I have used. It has also worked well on dry skin spots. My son has never had a diaper rash with this it is anazing! Goes on smooth on my baby's bottom with outhe leaving a mess! Fantastic diaper cream! I love this stuff. It's great for more then just diaper rash.. We use it in our house for everything! So nice to use with pocket diapers! This stuff is THE BEST! I use it on myself for inner thigh chafing, and it instantly feels better. Summer without this stuff would be (literally) painful. It lasts for ages and smells wonderful. Will purchase again for sure! LOVE! By far my favourite diaper cream (and I've tried many.) Love that's Canadian-made. Always stock up when it goes on sale! This is one of my favorite products by far! This is my fave baby product since I had my son 2 years ago. It works not only as a bum balm but it's safe for cloth diapers and be used for any wound and cradle cap too! I love this stuff and always have some with us wherever we go. Also, it's Canadian made--perfect! This is the best diaper cream ever! Amazing light lavender scent.. Great for everywhere on baby :D This cream creates a great barrier to prevent diaper rash and heal rash if you forget to apply. This product is great! Easy to wash off and has a nice light lavender scent. I so love Pea in the Pod! A super Canadian product that you can use for everyone in the family! The scent is calming and natural, and I get comments on how wonderful my son smells! His aunts love it! Super product! Don't even bother buying another bum cream for your baby. This one is cloth diaper safe, all natural and organic, and is the only reason my 14 month old has NEVER had diaper rash. It is gentle, safe, and eliminates any redness within hours. Use sparingly. Peas in a pod is GREAT. 1 of 2 diaper salves my son can use with out it irritating his skin any way. Its gentle and spreads evenly coating the little bum nicely. Best of all its safe for cloth diapers! This stuff should be called 'cure all'. I've used it on diaper rash, but also cradle cap, dry skin, pretty much anything & everything & everyone!! And it works wonders! Everyone should have a container for all ages! Safe for cloth diapers, has a great lavender scent, and works SO well - three months in with twins, and not a hint of diaper rash. Highly recommended! I've been using this cream since my baby's birth. No bum rash!